With the global talks over a climate treaty decelerating, Obama's trying to see if there are side deals to strike with China—something that could ease the worldwide talks along. So far, progress has been pretty modest. 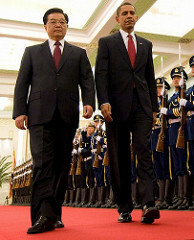 Earlier today, Obama met with Chinese President Hu Jintao and the two announced several key energy issues on which the countries would work together. There's $150 million over five years to start a joint "clean energy research center." There's cooperation on electric-vehicle standards and on sharing knowledge about energy efficiency. And there's a "road map" for renewable power and new cooperative deals on coal carbon capture. Nothing, though, on reducing greenhouse-gas emissions. That's roughly what many climate-watchers were expecting, but they're still awfully small steps. On a related note, Christina Larson has an excellent mythbusters-type piece in Foreign Policy on China's energy policies. I was mildly surprised to see that many experts disagree that China is "ahead" of the United States on renewable power—although Larson also nicely debunks the idea that there's some sort of energy "space race" to fret about. She also gets into the difficulties that the government in Beijing has in enforcing many of its low-carbon edicts (which I explored in a mag piece on China's green efforts awhile back). The article's one of the better summaries around of the state of play in China. More: Jake Schmidt of NRDC argues that both China and the United States actually made some subtle-but-important shifts in their stances on emission reductions today. Definitely worth a read.